We will rank your videos on the first page of the YouTube search result. Leave the optimization hassle to us. We’ll guide you with the way to embed and share the videos across your network the right way. It matters a lot more than you think! We’ll send you a regular report on the traffic and viewership of your YouTube videos. First off, you’ll be having a free discussion with us either over the phone or email. Then, we’ll identify the target keywords and proceed to the keyword research, which is a core process of the whole optimization. Then, if necessary, we’ll tweak the video, its thumbnails and make sure the video is clickworthy. The next step will be to optimize the Titles & Descriptions of your YouTube videos - with the data we collected via the keyword research. We will be also setting up the relevant tags that’ll get the video ranked on top of the YouTube search. The YouTube video SEO process doesn’t stop there. We will be providing you with guidelines and tactics on how to share it across your social media platforms. Main Target Keywords: Royal Enfield Video, Royal Enfield Ad. Ranked for both of the target keywords. Got over 2.2 Lakh views. Grew the YouTube Channel with 2.3K subscribers. 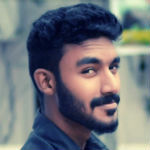 Amal Rafeeq He will be doing the keyword research and strategizing the SEO action plan to get your YouTube videos rank higher. 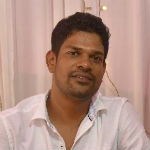 Pradeep T V He is the technical SEO person. Pradeep will set up the campaign and do the tech work to increase your keyword rankings on YouTube. Are You A YouTube SEO Agency? Kind of. We are into video marketing. We produce explainer videos for companies and products to sell help self themselves. But, we also provide video marketing packages to promote YouTube videos by using SEO. Do You Also Teach The Ways To Promote YouTube Videos? Yes indeed. We will explain you how the YouTube search works and why we optimize the way we do, to optimize the videos to get more views by doing SEO. We are affordable when it comes to our YouTube promotions and video SEO services. The pricing will be around 80 USD to 160 USD, depending upon the effort to be put in and the competition around. Are You Using Any Blackhat Methods? Certainly not. We know for sure that blackhat techniques aren’t the best way to go about it. We make sure we follow the best practices of YouTube video marketing and SEO.